There are literally thousands of security companies in the U.S. 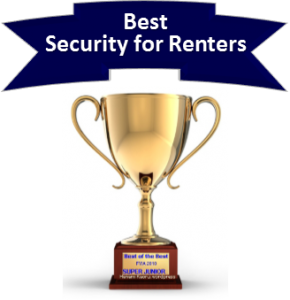 Selecting the best home security company to help protect your home and family can prove to be a challenge . If you’ve narrowed it down to an ADT Monitored Security System and LiveWatch Security, you have arrived at two of the best. ADT Authorized Premier Provider – Protect Your Home is the most highly recognized professionally installed security company…and LiveWatch offers an exceptional value in the DIY category of home security. Consequently, you are likely weighing the pros and cons of DIY vs professional alarm installation. On the one hand, a DIY alarm system is typically cheaper….but, for a little bit more, the professionally installed system may provide additional peace of mind knowing that is was correctly installed by a trained technician. 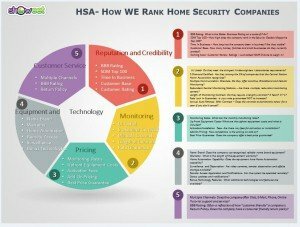 This 2016 review was written to help compare these two companies directly and determine which company best meets your unique security and home automation needs. ADT Monitored Security vs. LiveWatch Security is an early installment in our Home Security Advisor’s Prizefight Series where our security company contenders square off against each other in a side-by-side “Prizefight” comparative review. Each review will include 5 “Rounds” where both of the participants will be judged and ranked on specific criteria. The scores of individual rounds will be calculated and averaged to decide the overall winner who will reign supreme until the next heavy weight security bout! LiveWatch is based in St. Mary’s, Kansas, and is mow owned by Monitronics. Established in 2002, LiveWatch protects over 200,000 homes and families and has an A+ BBB rating. While installing over 200,000 systems per year, ADT Authorized Premier Provider – Protect Your Home, maintains an A+ BBB rating. The systems are monitored by the largest security company in the country which has controlled the top spot on the SDM Top 100 for over a decade. In a bit more than a decade, LiveWatch has distinguished themselves by offering world class customer service-earning them an A+ BBB rating, and a very consumer friendly sales approach. Instead of requiring the typical 3-5 year monitoring contract, LiveWatch requires only a one year contract- while still offering significant savings on up front equipment costs. While LiveWatch’s A+ rating is impressive and many will appreciate their flexible contract options, the ADT Authorized Premier Provider’s system is monitored by the #1 home security company. Both companies enjoy a solid BBB ranking, and significant experience helping to protect homes and families, but the latter is a system that carries the brand that has maintained a stronghold on the SDM’s #1 spot for decades – thus earning a win in this category. ADT operates 6 UL Listed, Five Diamond Certified monitoring stations across the country. This provides the highest level of redundancy- enabling calls to be rerouted in the event of a disaster in one area. Monitoring rates run from $36.99-$58.99. They both offer 24/7 protection against intrusion, emergency and personal safety, fire and environmental hazards. LiveWatch monitoring offers fully integrated cellular monitoring, even on their basic monitoring package. This eliminates the possibility of defeating the system by disabling cable or landlines. Their basic monitoring package is truly an exception value-at just $29.99 for basic cellular service, as is their premium service which includes their exclusive ASAPer feature, as well as 2 way voice authentication, Alarm.com interactive services, Geo Services and “Crash and Smash” technology which will notify the monitoring station even if the system is destroyed. Both companies offer quality monitoring services by highly regarded Central Stations. ADT Monitoring offers additional redundancy, but LiveWatch offers a host of additional services at extremely affordable rates. While LiveWatch used to hold a decisive pricing edge, especially on the lower end- their basic monitoring price has increased from $19.95 to 29.95 . Nevertheless, LiveWatch still offers additional monitoring features and maintains a lead in this category. Protect Your Home, an ADT Authorized Premier Provider, has been in the business of helping to protect homes and servicing their customers for over 18 years. They have a solid A+ BBB rating, and install ADT monitored home security systems which include the exclusive ADT 6 month service guarantee – which states that if any service oriented issue is not resolved within 6 months, the equipment will be removed and your money refunded. (certain restrictions apply) It should be noted, however, that this is not really a “no questions asked” return policy. With an A+ BBB rating, LiveWatch has a solid reputation for providing superior customer service for over a decade. While there is no professional installation available, most customers will find the system easy to install. LiveWatch offers an unheard of industry exclusive One Year Return Policy, in which you can get a full equipment refund at any time within the first 12 months. Both companies offer quality customer service, and and A+ BBB rating. 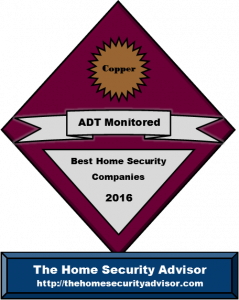 However, ADT Monitored security systems are professionally installed and they have a longer history of delivering award winning service. This trumps the LiveWatch One Year Return Policy. ADT Monitored equipment is professionally installed. Package pricing and manufacturer may vary depending on current promotions and the package selected.-but, typically the basic package pricing is competitive and carries the ADT 6 Month Service Guarantee (certain restrictions apply). ADT Monitored Systems offer an array of security and home automation devices and services. 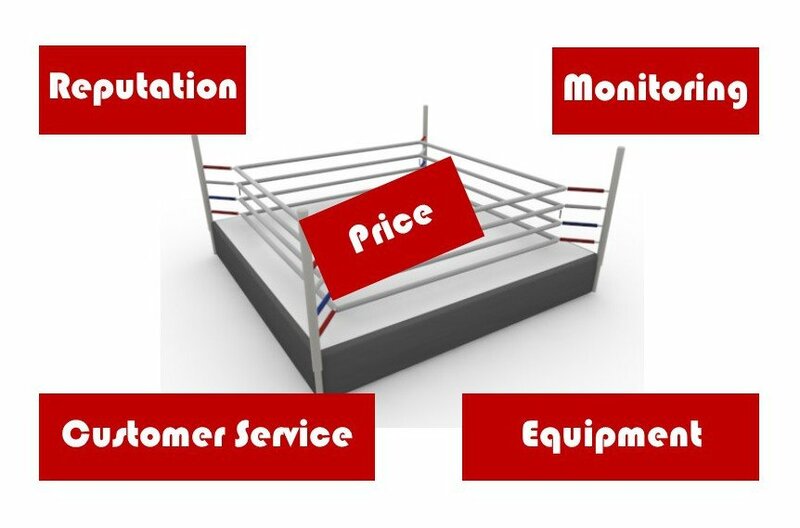 While advertised monitoring prices start as low as $36.99, the equipment on typical $99 packages is pretty basic. Upgrades, add-ons and monthly monitoring prices can mount up very quickly as additional options are included. While most ADT monitored entry level systems offers will include fairly basic equipment, LiveWatch includes a fully-equipped cellular GE system on their basic $29.95 package, and a premium touchscreen control panel in all their premium packages – the highly touted newcomer Qolsys IQ. Control. The Control Panel in their Plug and Play IQ is made by Qolsys. It is a technological home automation tour de force which incorporates the cellular, Wi-Fi and z-wave communication technologies within a gorgeous 7’ Android touchscreen user interface. This panel will even display current weather conditions and has a built in camera to identify who is disarming the system. 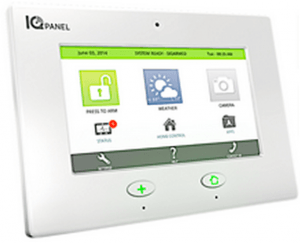 This panel is discounted and included in their $99 basic package with either Mobile Pro or Total Home monitoring subscriptions. The cost of additional sensors are also extremely competitive, with door and window sensors starting at just $30. There is a full line up of equipment available to meet virtually any security, home automation, energy management or surveillance needs- with all LiveWatch Plug and Protect monitored systems carrying a lifetime warranty. While the ADT Authorized Premier Provider offers professional installation, and most of the same overall capabilities of the LiveWatch packages…they are only available as a la carte upgrades and options-at substantially higher costs. The LiveWatch program offers significantly more bang for the buck. For $99 and under $30 a month, you get a premium touchscreen cellular panel that includes an internal camera that records arming activities and provides live weather reports. Their $39.95 Total Home package includes Crash and Smash technology,Location Based Control and their exclusive ASAPer instant notification technology. However, if you are looking to be able to use voice control to operate your system, the ADT monitored system provides that show stopping feature. While ADT Monitored systems reflect reasonably competitive packages and rates, the costs may quickly escalate depending on your needs and interests. Basic packages are available starting at $99 for installation and as low as $36.99 for monitoring, but if you want interactive services (the ability to control your system remotely on the internet or a mobile device), cellular or home automation capabilities-both up front costs and monthly monitoring rates can quickly skyrocket. Typical monitoring packages run from $36.99-58.99+. Professionally installed components are often significantly more expensive. Many advanced monitoring features(ASAPer, Crash and Smash, Live Voice Assist, Geo Services) are included at extremely competitive price points. ADT Monitoring simply doesn’t offer some of the interactive monitoring bells and whistles, but the Voice Control feature might outweigh that for many customers looking for some state of the art tech wizardry. While the ADT Authorized Premier Provider – Protect Your Home offers superior name recognition, top notch security value and professional installation –LiveWatch wins this round bu including more advanced features and services in the basic programs, lower monthly monitoring rates and lower add on equipment pricing. Both of these Security Prizefight Heavyweights are worthy contenders for anyone looking to help protect their homes and families with a quality home security and automation system. Overall, ADT Monitoring offers better name recognition, professional installation and a more storied history. However, LiveWatch has been in the business of protecting homes for over a decade, also enjoys an outstanding BBB rating – while offering more advanced technology and superior monitoring features at lower prices. There may be some who still prefer the name recognition and are willing to pay a bit more for professional installation, but the value conscious consumer will find that … LiveWatch is a Superior Value! Why choose ADT Monitoring Over LiveWatch? Despite the fact that LiveWatch wins in overall value…it is a DIY system only. There are many people out there that just feel more comfortable with a professionally installed system and a name brand that is the most highly recognized brand in the home security industry. 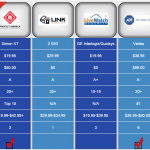 While LiveWatch offers a compelling value proposition, you may want to take a few minutes to investigate further and see why ADT helps protect more homes and families than the next 10 competitors combined! Thank you for visiting. Please feel free to leave your comments and feedback on this ADT Monitored Security vs LiveWatch Security-2015 Review, below.